You guys, I have a pet. If you know me, this is not big news. Growing up, I had fish, lizards, parakeets, gerbils, cats, dogs, and a Venus fly trap (not all at the same time). Then I married a man who (well, "hates" is probably a little strong, but let's go with it) hates animals. He has what some might call a psychosomatic allergy to anything with fur, and although over the course of our first several years together, I suggested every breed of "allergy-friendly" dog and cat known to man, it was to no avail. Then I had one child, then two, then three, and suddenly my instinct to take care of little creatures was COMPLETELY SATIATED. David breathed a sigh of relief. The man of the house left yesterday for a 24-hour business trip to Oakland (which doubtless he will think long and hard before doing in the future), and this afternoon I was pulling weeds in the rocky area of our backyard. I noticed what appeared to be a lumpy, multicolored rock under a very healthy patch of bermuda grass. Upon closer inspection, this rock had four legs, a pointy, scaly head, and two beady little black eyes. Then, I called the kids out to come see our new friend. Me: Help! I found a little turtle thing in my backyard! What is he, and what do I do with him? Her: Do you want to keep him or get rid of him? Me: I'd love to keep him, if he doesn't mind. Mostly I just want him to be happy and not dead. Her: Yes, "not dead" is always a good thing. Let's start there. I sent her a picture, and it was determined that my new friend was a Sonoran Desert Tortoise. They are a protected species in Arizona, and it is illegal to buy them, sell them, or catch them in the wild, but apparently if a young 'un shows up in your backyard it is permissible to save it and provide it a loving home. Which I have happily agreed to do. 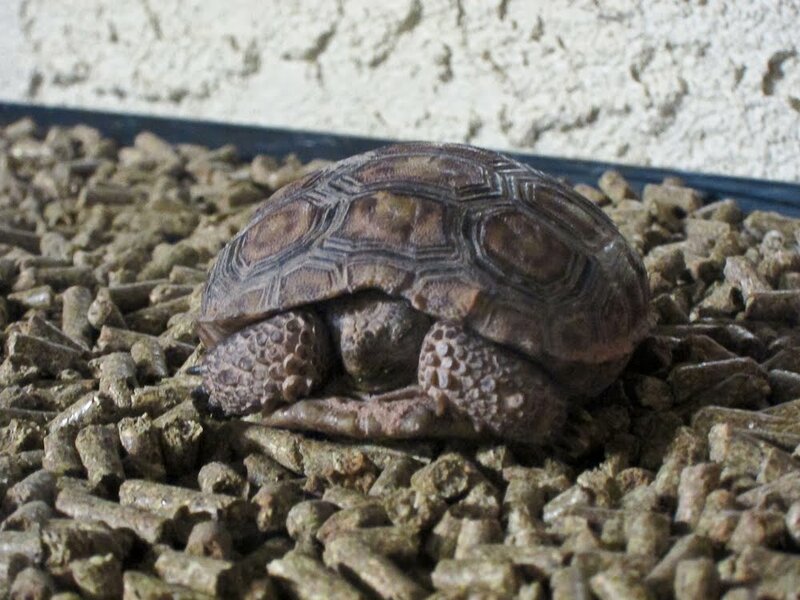 The little guy is too small to survive outdoors in a suburban setting (apparently wild tortoises spend 95% of their lives in underground burrows, because they are not stupid), so it's a good thing I found him when I did because the rocks he was laying on get mighty hot in the summer, and it is actually possible to "cook" a young tortoise. My reptile-expert friend has a reptile-expert husband, who manages the Arizona Reptile Center, so I brought my scaly new friend, his makeshift habitat, and my three completely twitterpated children to that fine establishment. We got him all set up with some sweet new digs, a couple of lights to provide UV rays for optimal shell growth and temperature regulation, and calcium supplements (because you just can't be too careful). CUTE!! So darling! What a sweet story that he found you guys! I love how excited the little kiddies are to have a "pet." 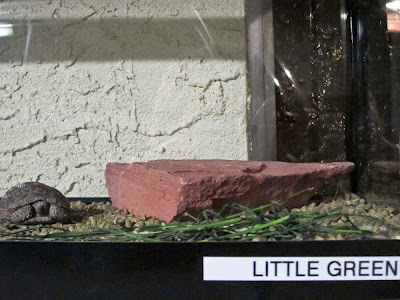 Birds, turtles--wildlife is attracted to your place! Cute little fella. Hope he thrives in his new habitat. Betcha wouldn't have ever found a tortoise in your old backyard. He is really cute. I have seen him in person!